Last-Minute Playa Gear in Gerlach! Yes, it’s true. 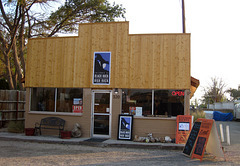 I’ve partnered with Friends of Black Rock – High Rock in Gerlach to stock their Visitor’s Center & Shop with playa gear as a fundraiser for FBR. Main Street is the main road through Gerlach. FBR is at the far end of town on the left, just before the bazaar. The shop is open daily now until Monday August 25th. FBR will be closed during Burning Man week so the crew can attend… but stop by on your way out. Women’s lingerie, camisoles, bloomers, slips, boots and Steampunk shorts, skirts, tops, jackets and vests. Mens cargo shorts, ironic tee-shirts, Steampunk slacks, dress shirts, vests, sport coats, leather jackets and boots. Hats including cowboy, straw hats, Steampunk, wool caps, berets. Kids furry vests, tails, shorts, skirts, shirts. Personal care; locally-made soaps & lotions, sunscreen, lip balm, aloe vera, Dr. Bronner’s soap, toothbrushes. Playa Gear: 4 styles of playa goggles, bandannas, face wraps, tool belts, socks, work gloves, charcoal, lighter fluid. Books, maps, games, walking sticks, FBR tee-shirts, stickers, patches and gifts. This non-profit organization that helps manage the resources of the Black Rock Desert region… and educates the public to foster stewardship and preserve its unique character. They host tours, hikes, campouts and fun events on the playa. Basically, FBR protects our playa, so it’s a great place to shop, ask questions, donate or just visit and learn about the playa. I’ll be volunteering at the shop on Sunday August 24. On playa, I’m at 5:02 and I. Look for Betty Dawn, my vintage Steampunk trailer.